A Monthly Magazine Devoted to Psychical Research and Occultism. 1/1, August 1915-November 1916. 36-80 pp., $1.00-$2.00 a year, 50 cents a copy. Between June 1917 and February 1918, called Psychical Research Review. Christensen, a Dane, was a psychic and astrologer. In the journal he re-printed his discourses on his 45-hour trances and published sections on self-help, secret force control, the meetings of his Psychological Research Society, Inc. ($10.00 a year), and a Mediums' Directory. Articles on spirit paintings (with reproductions of images by the likes of Elizabeth Lamb Fellows, "phenomenal controlled artist"), and contributions by W.J. Colville and Hereward Carrington. For filler the journal reprinted sections from Bulwer Lytton's The Coming Race. 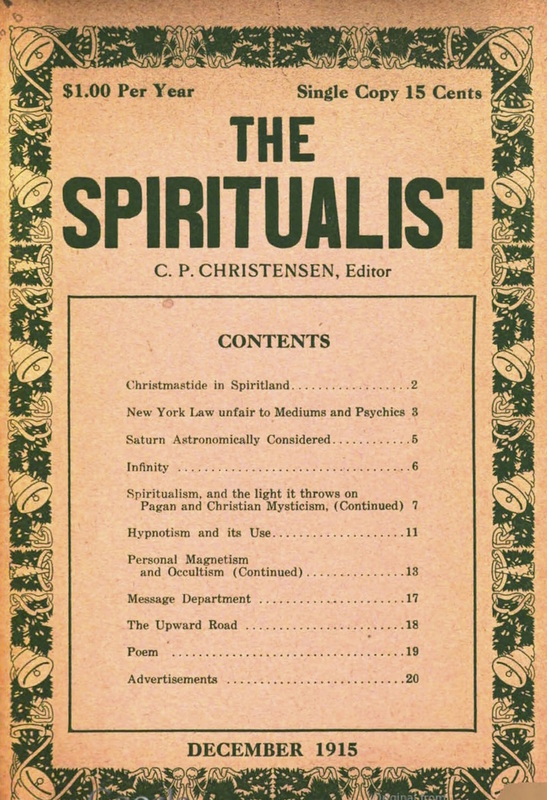 The journal's emphasis on Mental Suggestion and Psycho-therapeutic methods, and on astrology (Christensen practiced both) is an excellent example of the hodgepodge spiritualism had become by the First World War. The journal carried advertisements for H.P. Holler's Theomonistic church and his Oriental University, with which Christen seems to have been involved. Financially, the journal seems to have survived wholly on its publication of pre-bundled national advertisements rather than on its content. NYPL; NSAC Lily Dale; 1 issue Skidmore, Lily Dale.